Thanks for all of your support (and patience) while I continue on this excruciating journey of creating templates for the entire 737 family of aircraft! “Excruciating” is probably too light of a word considering all of the blood sweat and tears that I’ve put into this little project over the past few weeks or so, but I will admit that most of the struggle has been my own fault due to not paying attention to the little (but oh-so significant) details. Making mistakes on one template has never been that big of a deal, because it normally doesn’t take very long to go back in and fix whatever it is that’s wrong and to regenerate updated illustrations for this blog and my online store. The problem with my 737 family of templates is the fact that I’ve done nine of them now (including this 737–400), and every time that I realize that I made a little mistake (it happens more often than I care to admit), I have to go back in and fix every single one of them. 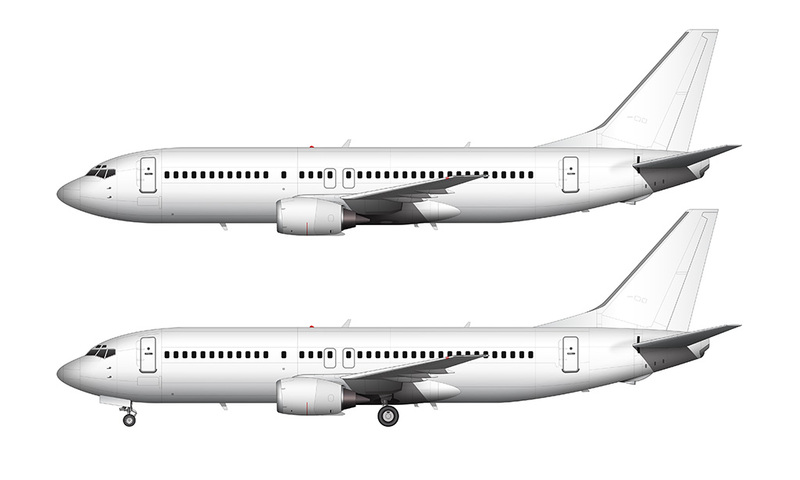 Making matters worse is the fact that most versions of the 737 have multiple sub-variants (winglets vs no winglets) and that just amplifies the pain and frustration. 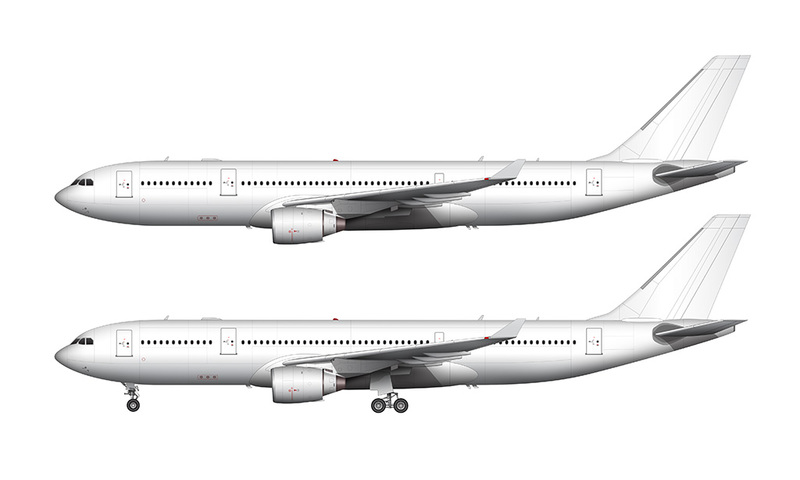 It’s a very time consuming and mind-numbing process to modify and then to regenerate final illustrations for every template, and now that I’m getting down to the final few 737 versions, it’s a really big (and soul-crushing) deal to discover a mistake and then have to go back and update everything. Long story short, I guess what I’m trying to say is that this 737 series of illustrations has my my most frustrating series so far. However, I will admit that I feel immensely satisfied with what I have been able to produce over the past few weeks, and I’m very excited to be getting close to the end. There’s only three more to go after this one! Although the 737-400 was nowhere near being the most popular version of the 737 ever (that honor goes to the 737-800), it’s still the variant that I think of first when somebody says “737” to me. I’m pretty sure that I have Alaska Airlines to thank for that, because the -400 was the main type of aircraft they flew to my home airport of SAN (and nearby SNA) back in early 2000’s. For some reason another, all those -400s with that friendly Eskimo on the tail have been etched into my brain and it’s the 737 I think of the most when I think of the 737. Weird, I know. 486 737-400s were produced between years of 1988 and 2000, which is 97 more than the 737–500. 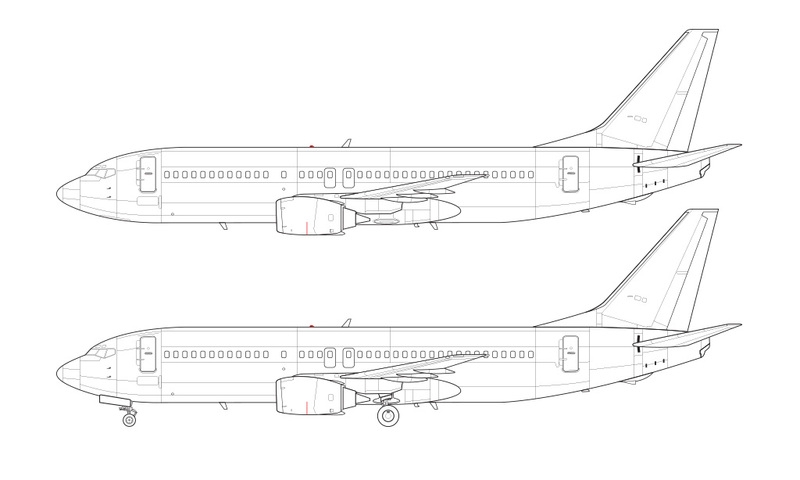 The 737–300 (which I will post a template for next week) was the king of the 737 Classic series with 1113 total sales. If you’re curious, it was the 737-100 which was the major 737 variant with the fewest sales. Only 30 buyers lined up for that one, which is odd considering that the 737 went on to be the most popular jet airliner of all time. Finally, I would like to apologize for the fact that I don’t yet have an illustration of the 737-400F for you like I promised yesterday. Remember at the top of this post where I was explaining how it takes a lot of time to go back in and fix mistakes that I inevitably make with each illustration? It turns out that the engine cowling that I illustrated for the -500 (which carries over to all 737 Classic variants) was all wrong and I had to go back and fix it this morning. So – the time that it took to fix that goof took away from the time that I was planning to use for creating the freighter version of the 737-400. No worries though, because I’m still planning on producing it and I hope to get it posted next week along with the 737-300. I’d like to try to get the -200 posted next week as well, but no promises on that one because it’s going to take some time to draw those JT8D engines and get them strapped to the wing. Obtaining decent reference material for those really old aircraft isn’t easy, as I recently discovered with the template creation process of my Douglas DC-8. Cameras weren’t very good back then, so I hope that I’ll be able to find some decent photos which aren’t so grainy that I can’t see any of the details. But do you know me – I like a challenge, and I’m really looking forward to illustrating those old birds! And the -100 too, which will be coming last!